1.5-hour train journey, departing at 11:30 a.m. Your journey begins here in Napa, but your destination takes you to another time and place. Private label wine. Soup du Jour or fresh Bibb Lettuce Salad. Your choice of gourmet entrées. And of course, coffee or tea and a decadent dessert aboard our elegant vintage train. Savored as you head northbound through the Napa Valley to St. Helena. From the Train you board the private shuttle that will take you to Castello di Amorosa, across the moat, and into another world altogether. Battle-worn turrets. Stunning hand-painted Italian frescoes. A labyrinth of underground caves. A torture chamber room. Authentic in every detail, every stone, every tower, every French oak barrel. If it feels like you’re in a 13th-century Tuscan castle, that’s because you are. A labor of love more than 15 years in the making. After meticulous research, study and touring of castles and wineries in Italy, armed with a tape measure, camera and film, and sketchpad and pencils a vision took hold. And then came to life. To say this 13th-century castle is authentic is an understatement. Built by master builders from five countries, with handmade materials, using ancient methods from 1,000 years ago. It has all the elements you would expect of a true medieval castle—defensive fortified walls, courtyards, secret passageways, even a prison and torture chamber. And the castle’s crown jewel, a 12,000 square foot cross-vaulted frescoed Grand Hall. 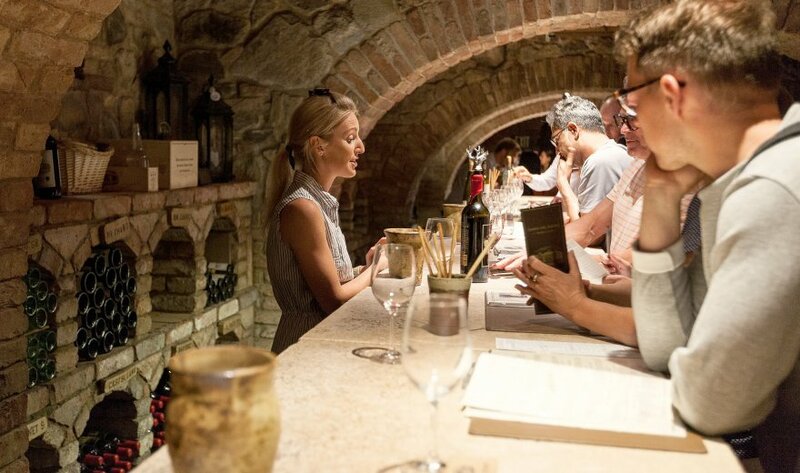 As if that’s not enough, the winery sits on a spectacular property, where the castle’s defensive positions overlook the Cabernet Sauvignon, Merlot, Sangiovese and Primitivo vineyards. One of the most beautiful and interesting buildings in North America with exquisite, award-winning wines that are only available at Castello di Amorosa. After this unique and enchanting experience, it’s back to real life. And your private shuttle that brings you back to the Napa Valley Wine Train Station. *No children under 5 allowed on this package. All of our winery tours require moderate stair climbing and standing for extended periods. We encourage guests who may have difficulty performing these two activities to consider one of our dining journeys. In the spirit of traditional rail seating, you may share a table with another party.